In Putin's Russia, An 'Adhocracy' Marked By Ambiguity And Plausible Deniability : Parallels Donald Trump Jr. found his meeting with Natalia Veselnitskaya a waste of time, but her approach fits into a larger pattern of freelance political activity that has come to characterize Putin's Russia. 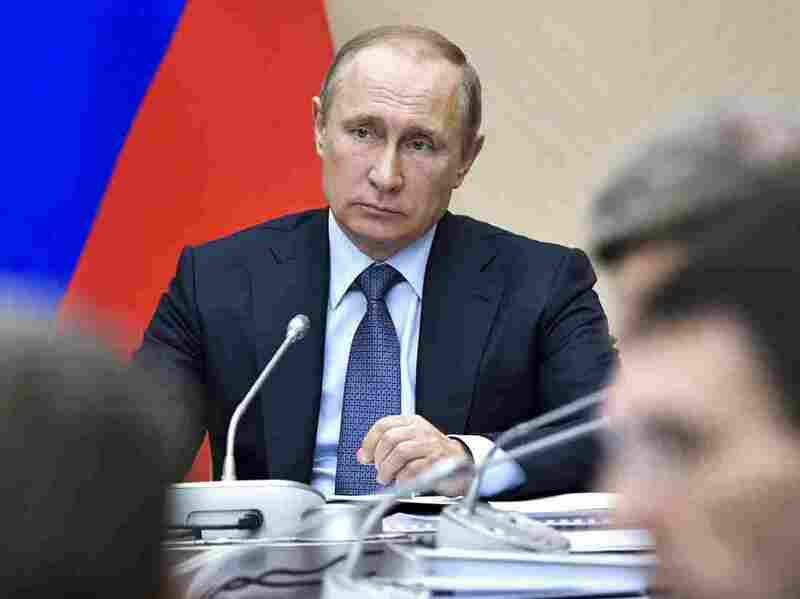 Russian President Vladimir Putin leads a Cabinet meeting at the Novo-Ogaryovo residence outside Moscow on Wednesday. When Donald Trump Jr. agreed to meet Natalia Veselnitskaya last summer, she was introduced to him as a "Russian government attorney" with dirt on Hillary Clinton. After it turned out that Veselnitskaya couldn't deliver the goods, the meeting ended quickly. But the fact that Trump Jr. didn't even question that the meeting had been billed as part of Russia's support for his father has hardly dispelled suspicions of collusion between the Trump campaign and Moscow. Veselnitskaya insists she wasn't working for the Russian government — and the Kremlin denies any knowledge of her. Proving the contrary is practically impossible. Trump Jr. may have found the meeting a waste of time, but Veselnitskaya's seemingly hapless visit to Trump Tower fits into a larger pattern of freelance political activity that has come to characterize Putin's Russia. From Russian "volunteers" fighting in eastern Ukraine to "patriotic hackers" launching cyberattacks on the United States, nongovernment actors with no formal ties to the Kremlin provide official Moscow with a cushion of plausible deniability. Donald Trump Jr. may have found his meeting with Russian lawyer Natalia Veselnitskaya, shown here in Moscow in November, a waste of time. But Veselnitskaya's visit to Trump Tower fits into a larger pattern of freelance political activity that has come to characterize Putin's Russia. "That's precisely the kind of thing you can then take back to Moscow and leverage. At that point, you suddenly become interesting for the Kremlin. So this is a classic case of political entrepreneurship from an individual rather than some long-term, planned intelligence operation," says Galeotti. "In the West," he says, "we're used to a system in which people's job titles actually tell you what they do. Russia has become rather different, deinstitutionalized. It's become what I have called an 'adhocracy.' "
In that sense, Aras Agalarov, the Russian real estate magnate whose son was mentioned as the organizer of the Veselnitskaya meeting, may have been on a similar mission — even though he calls the whole story "fiction." "It appears that there was an attempt by the Agalarov family to provide a specific service. Whether that service was volunteered by the Agalarovs or it was, let's say, prompted by somebody else — that is something that we have no idea about," said Vladimir Frolov, a Russian political analyst. "So there are really very murky questions," he said. "But you don't have to be a Russian government employee to perform a service for the Russian government." Journalist Mikhail Zygar says that it would be inaccurate to call Agalarov "an oligarch" or "Kremlin-connected" as he lacks the requisite business clout and political influence. Asserting that someone like Veselnitskaya or Agalarov is linked to the Kremlin is an oversimplification, Zygar says, since "there is no exact center of decision-making" in Moscow. In his 2016 book, All the Kremlin's Men: Inside the Court of Vladimir Putin, Zygar argues that power in Russia is actually very diffuse, with an army of government officials trying to anticipate what Putin wants — without necessarily getting a direct order. In other words, Russia is ruled by a kind of collective Putin. "They usually do not say anything directly. They always hint," said Zygar. "They would never say, 'Please steal those billions of dollars or please murder those journalists.' They would say, 'Do what you have to do. You know your obligations; please fulfill them.' "
Unwritten agreements and non-state initiatives were on full display in Russia's conflict with Ukraine. While the seizure of Crimea in 2014 was a Kremlin-guided operation, the ensuing war in eastern Ukraine was largely unleashed by Russian soldiers of fortune funded by private money from Moscow, according to Zygar. Yet in June, Putin suggested that "patriotically" inclined hackers may have felt Russia was being slighted and taken matters into their own hands. "Hackers are free people, like artists," he said. Russia's loose system of command-and-control creates a filter of plausible deniability for the Kremlin, says analyst Frolov. "It's very convenient. Even if things fail, there's no direct fallout — negative fallout — for the Russian government," he says. It would be wrong to view Russia as a country ruled from the top down, says Galeotti, whose research focuses on Russia's security agencies. He says plenty of initiatives come from the bottom up — from people who may have only informal connections to the government — and then the Kremlin picks and chooses the ones it likes. On the surface, an "adhocracy" may appear more nimble than ponderous Western democracies.